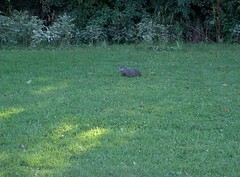 I have written previously about my sightings of the neighborhood groundhog. Well, this weekend, I saw him/her again, and happened to have my camera in my purse!Â I stopped my car, got out, and got a couple of shots.Â This is the best one (and it is also blown up a bit, below). So here’s my little groundhog ‘buddy.’ (I realize that our ‘friendship’ isÂ one-sided; he/she ran away into the woods after I took this picture and started talking to it in what must have seemed a patronizing – but for my part, purely affectionate – tone). I think that one of the reasons I may have been seeing him/her out eating so often is that it will soon be time for hibernation. Apparently, these little guys pack on the weight at this time of year, just before going into a deep deep sleep, and then waking up much thinner in about February. 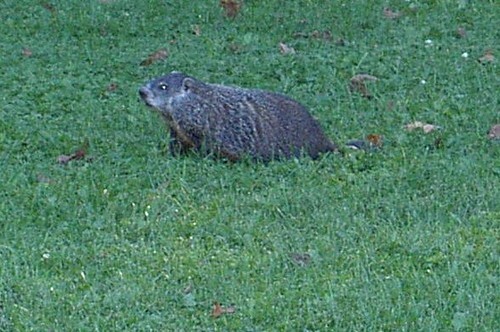 So I’m glad I got this picture of my groundhog buddy before he or she disappears into the burrow for the upcoming cold months. You can usually spot (and delete the comments of) comment spammers not only by the fact that they are “strangers” and have a commercial-sounding web address (and post other sales buzzwords along with their address), but also because they almost invariably post the same kind of comment: something designed to “fool” the blogger into thinking it’s a genunine and personal response to the site.¬† Usually something along the lines of: “Great site.¬† Thanks for your work.”¬† Or “I’ve been searching on Google, and this site has it.”¬† Or, my favorite, “Informative¬†site.¬†Thanks, guy!”¬† (Often,¬†these themes, and their¬†variations, are phrased in¬†rather¬†stilted English). No More Anxiety Dream? Should That Worry Me? I don’t have it very often.¬† But it pops up from time to time – usually¬†during a period in which¬†I’m busier than usual,¬†and always with the same general theme. In the dream, I suddenly remember that I have a test to take or a long paper to turn in – either that day or the next day.¬† The setting of the dream (as well as the theme of the class)¬†can vary, but these frequently “take place” in¬†either my highschool or my middle school.¬† Inevitably,¬†I realize that I’ve forgotten about the class for the duration of the now-ending¬†semester.¬† I panic and wonder how I’m ever going to pass the class.¬† And mostly, I feel upset and astounded that I’ve forgotten this obligation altogether. Well, I’m wondering now if I’ve dreamed my last of that dream. . . Earlier this week, after being awake for most of the night listening to and taking turns caring for a teething (and ear-aching) Emma, I was exhausted. I slept soundly only between 4:00 a.m. and 6:00 a.m.¬† And during that time, I had the dream. Is it a bad thing to have reached the state, in the waking, as well as the sleeping¬†world, that I just don’t let the stress get me down anymore? Have I achieved a state of Zen, or am I just too tired to care? The jury is still out¬†on whether my¬†sense of peace with it all is a good or a¬†bad development. On the drive over to my mother’s house last night to perform my cat-sitting duties, I found myself thinking about a pseudo-religious essay I¬†read recently about cats and faith. Cats are to People, as People are to The Gods, the essay had analogized. The essayist noted that traveling cat owners think about their cats’ well being¬†during each day of their absence, and¬†expounded on the¬†comparison to query whether cats, when their owners are away, experience themselves to be abandoned and forsaken, or whether they have¬†faith in their¬†owner’s abiding love and eventual return. You are currently browsing the archives for the Zen category.